THE BEST OF THE BEST! Natures Distributing ORIGINAL Stacking Planters are UNIQUE! Nowhere else will you find our patented self-watering system; including FREE patented grids! Stack them up and create amazing floral displays that'll have your houseguests tickled pink! Planters are SELF WATERING, but yes, you do have to water them first! Water will trickle down to the planters from the top, sufficiently keeping your precious plants fed! Stacking planters are designed to be free-standing or hung chain is included. Our planters are perfect for annuals, herbs, strawberries, flower arrangements, strawberries, and so much more! OUR PLANTERS STAND ALONE: The ONLY patented self-watering system available (Yes, you must add the water). We are the pioneers of the Stacking Planter industry! 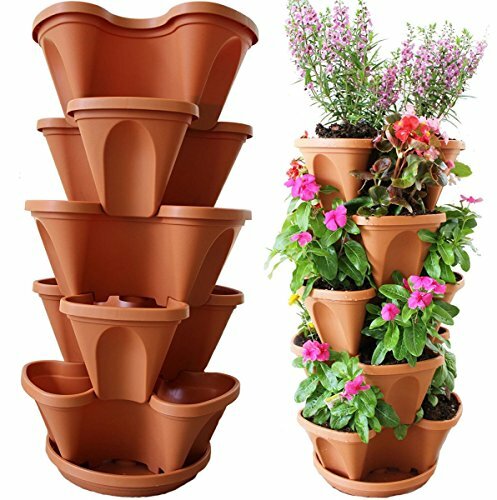 MULTI-TIER SET: Set consists of five tiers of planters, five patented self-watering grids, tray (for stacking), chain with swivel (for hanging), and instructions. SELF-WATERING BENEFITS: Don't worry about overwatering! These pots can self-regulate so plants stay healthy and hydrated, Self-watering - helps evenly distribute moisture throughout and keeps plants healthy because of a consistent water supply! THE BEST OF THE BEST: Our Stacking Planters include FREE GRIDS and a FREE CHAIN powder coated for outdoor use for hanging! Food Grade Poly Propylene. BPA free. UV protection included. If you have any questions about this product by Nature's Distributing, contact us by completing and submitting the form below. If you are looking for a specif part number, please include it with your message.